The rational design of advanced nanomaterials with enhanced optical properties can be reached only with the profound thermodynamic and kinetic understanding of their synthetic processes. 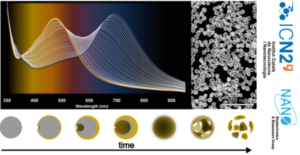 In this work, the synthesis of monodisperse AuAg nanoshells with thin shells and large voids is achieved through the development of a highly reproducible and robust methodology based on the galvanic replacement reaction. This is obtained thanks to the systematic identification of the role played by the different synthetic parameters involved in the process (such as surfactants, co-oxidizers, complexing agents, time, and temperature), providing an unprecedented control over the material’s morphological and optical properties. Thus, the time- and size-resolved evolution of AuAg nanoshells surface plasmon resonance band is described for 15, 30, 60, 80, 100, and 150 nm-sized particles spanning almost through the entire visible spectrum. Its analysis reveals a four-phase mechanism coherent with the material’s morphological transformation. Simulations based on Mie’s theory confirm the observed optical behavior in AuAg nanoshells formation and provide insights into the influence of the Au/Ag ratio on their plasmonic properties. The high degree of morphological control provided by this methodology represents a transferable and scalable strategy for the development of advanced-generation plasmonic nanomaterials.